What are the Benefits of CNC Machining Service vs. Manual Machining? Home » News » What are the Advantages of CNC Machining vs Manual Machining? CNC (Computer Numerically Controlled) machining is a manufacturing process in which pre-programmed computer software dictates the movement of factory tools and machinery. Using this type of machine versus manual machining can result in improved accuracy, increased production speeds, enhanced safety, increased efficiency, and most of all cost savings. What are the Benefits of CNC Machining? The accuracy of the CNC machine ensures consistent product quality. The process is more precise than manual machining and can be repeated in exactly the same manner over and over again. Increased production speed and increased efficiency. Computers are used to control the machines, the process is automated therefore increasing speed and quality of manufacturing. Considering machines do not tire or need breaks it makes it more efficient than manual machining. One of the main advantages for the operators of CNC machines is safety. Using CNC machines are much safer than manually operated machines as they work behind a guard or even a closed, transparent safety door. 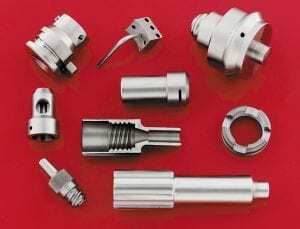 CNC Machining is more cost effective. Traditional machining requires one operator per machine. CNC machining requires fewer machine operators since one skilled operator can run several machines at one time. Since the CNC is so accurate it reduces errors from the manufacturing process and eliminates unnecessary waste. Eagle specializes in Swiss CNC Machining, delivering some of the most intricately formed stainless steel parts available in the industry. We’re capable of working in diameters ranging from 0.030″ to 2″, allowing us to meet the unique specifications of even the most demanding applications. For more information on our Swiss CNC machining services and capabilities, just contact us or request a quote today.